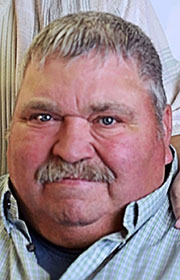 HARCOURT — Dennis W. Davis, 67, passed away Wednes­day, Aug­ust 22, 2018 at Mercy Med­ical Center, Des Moines. A Cele­bra­tion of Life will be 10:30 a.m. Monday, August 27, 2018 at United Methodist Church, Dayton with Pastor Jim Davis officiating. Burial will be at a later date. Friends may call from 4:00 to 7:00 pm Sunday, August 26, 2018 at United Methodist Church, Dayton. Palmer Funeral Home, Gowrie is in charge of arrangements. Dennis is survived by his wife, Berneta Davis of Harcourt; daughters, Christi Jean Harmon of Boxholm; Christy Lee (Scott) Nelson; sons, Curt (Becky) Davis of Lehigh; Craig (Mylie) Davis of Dayton; 12 grandchildren; 1 great-granddaughter; sister, Deanne (Bob) Strandberg of Rockwell City and brother, Damon (Linda) Davis of Harcourt. He was preceded in death by his parents, Marion and Lorraine (Cathcart) Davis. Dennis W. Davis was born December 12, 1950 in Fort Dodge. He graduated from Central Webster High School in 1970. He continued his education at ICCC in Fort Dodge and graduated from the Auto Mechanics program. Denny was united in marriage to Berneta Dorman on January 4, 1975 in Harcourt. He was employed with DX Gas Station, JCPenny Auto Center, Iowa Beef Processors,Fort Dodge Asphalt, Dorman Farms, Gustafson Farms, Consolidated Coop, and FC Coop. He was also a Beef and Pork Producer. Denny enjoyed hunting, fishing, camping, and lived for his family and dog, KC. He was a Sunday school teacher, 4H Leader, on the church board and belonged to the Harcourt Fire Dept.